Our editor, Teresa Fisher, recalls the time she would carry her passport in her ski rucksack, in case it was required at border crossings. This season, she’s on a ski safari investigating the former smugglers’ routes between Austria and Switzerland – now popular family ski circuits, and suitable for all levels of skier or boarder from elementary upwards. How cool it is to cross an international border when skiing – to ski from one culture, cuisine language to another. 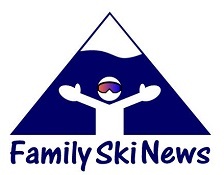 There are currently several border-straddling ski areas in the Alps – Zermatt-Cervinia (Switzerland/Italy); The Milky Way (France/Italy) and Les Portes du Soleil (France/Switzerland); and the lesser-known Kanin-Bovec-Sella Nevea (Italy/Slovenia). But none compares with the Austrian resort of Ischgl. In Ischgl, not only can you ski between Austria and Switzerland, but you can follow their infamous Smugglers’ Routes. It was once big business for locals of the Paznaun region in Austria to smuggle goods across the border to Switzerland, even as recently as the 1950s. Coffee, tobacco, furs and American nylon stockings were all part of the contraband carried between Ischgl and the Swiss village of Samnaun. 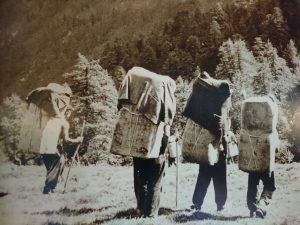 It would take the locals up to 10 hours to cross, on foot, by mule and on skis – they didn’t have the luxury of ski lifts, of course – and they would be carrying up to 10kg of booty on their backs. At the border, the customs officers would turn a blind eye as they passed. They would even sometimes buy the goods themselves. 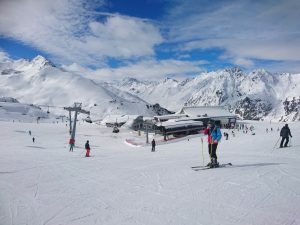 Ischgl has now ingeniously recreated the smugglers’ original routes in a series of family-friendly ski trails called the Smugglers’ Circuits. So often, the big ski ‘circuits’ of most resorts are the territory of advanced skiers, with considerable distances and precipitous black slopes along the way; while the elementary and intermediate routes are generally short, unremarkable and un-noteworthy. Not so in Ischgl. 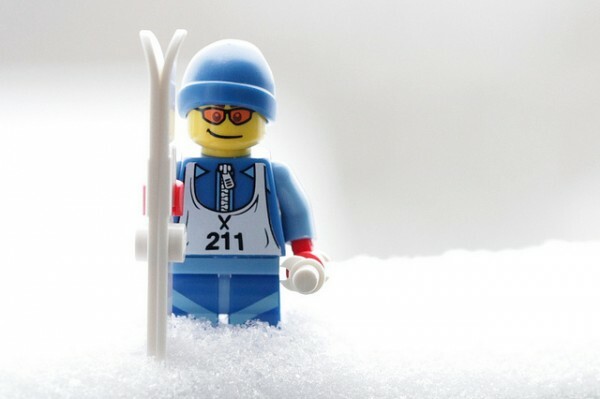 The big ski ‘circuits’ in most resorts are usually the territory of advanced skiers, with considerable distances and precipitous black slopes along the way; while the elementary and intermediate routes are generally short, unremarkable and un-noteworthy. Not so in Ischgl. The Bronze Smugglers’ Circuit uses only blue runs (so it’s suitable for good elementary as well as intermediate skiers upwards) and it’s the shortest route of the three. Nonetheless, it’s not for the faint-hearted skier nor for tired toddler limbs, as you still need to cover 40km of pistes and a vertical descent of 8,282m. It’s a full daytrip (it takes 4 hours of non-stop skiing) so forget that holiday lie in… it’s really worth getting up early to make a head start on the resort’s perfectly groomed pistes before the slopes become crowded. Pack snacks, water, sunscreen, spare gloves and layers for the kids, and off you go on the ultimate smuggling adventure of your holiday. You’ll be well rewarded by sensational mountain vistas, plenty of piste-side huts for refreshments, and a whopping sense of achievement as you cross the finish line with all the family in tow. You can find further details of check-points (there are 11) and technical data (distances, altitudes, etc) HERE. 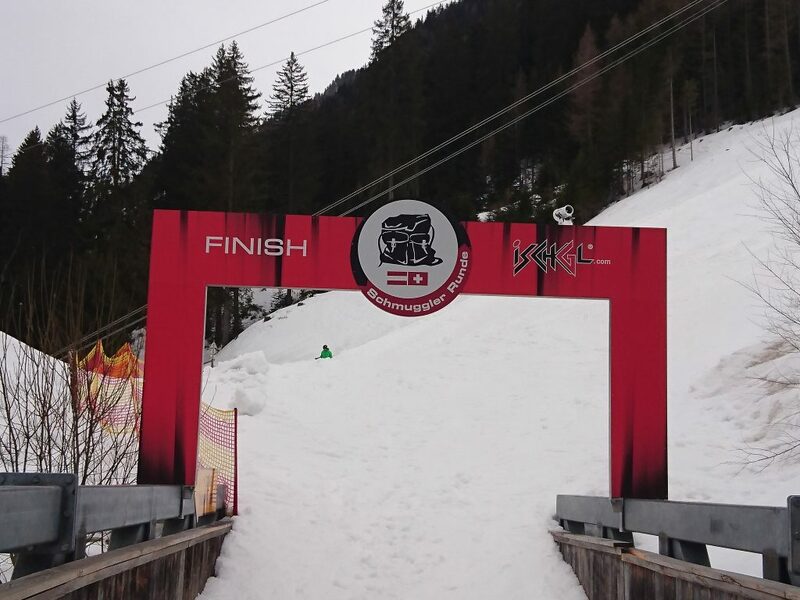 The silver circuit includes a number of black and red runs – so it’s not suitable for elementary skiers or beginners. You can find further details of check points, altitudes and technical data HERE. The Smuggler’s Gold Circuit is only for experienced and capable skiers and boarders – it’s one of the longest and most challenging ski circuits in the world, with some impressive steep descents and black runs and steep descents (Total distances: 59km, 12,926 vertical metres). It takes a good 4 hours to complete without stops, so start early if you intend to stop for hot chocolates or lunch en route. You can find further details of checkpoints, altitudes and technical data HERE. Although passports are no longer needed to cross the border, there is… bizarrely, at the top of the mountain, in the middle of nowhere… a duty free shop. The adjoining Swiss resort of Samnaun is a tax-free enclave, so be sure to ski with an empty rucksack as it’s the perfect opportunity to stock up on bargain-price perfume, make-up, jewellery, booze, Swiss watches… Yes, really. If you want to treat yourself to a new Rolex on a ski day-out, this is the place for you. It’s half-way down piste number 80. 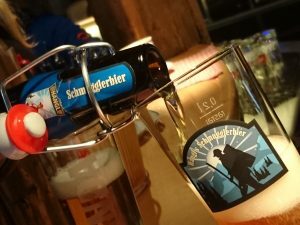 The duty free shop also happens to adjoin a snug, eccentric slopeside restaurant, the SchmugglerAlm (Smugglers’ Inn”), which serves the local beer, called – yes, you’ve guessed it – Schmuggler Bier. Just saying the beer’s name makes you sound a bit sloshed. 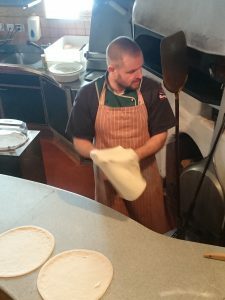 I highly recommend it to wash down the hearty pizzas, made before your eyes by one of those flamboyant chefs, who spins the dough above his head before frisbeeing it (with toppings, of course) into the wood oven. 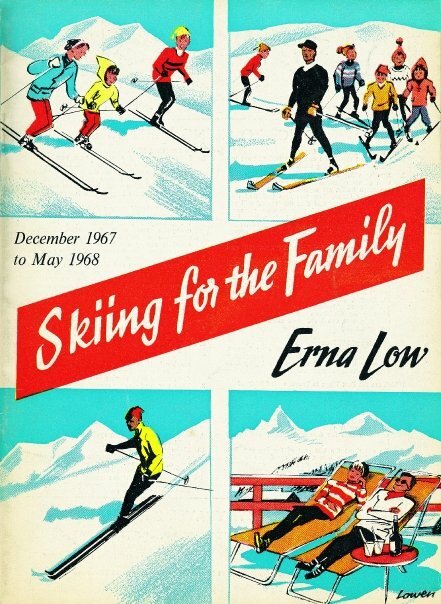 (However we don’t recommend skiing following the consumption of alcohol). The restaurant prides itself on its traditional cuisine, with such old-fashioned dishes as smugglers’ soup (a broth with bacon and cheese dumplings); hunter’s salad (with deer fillet and goat’s cheese); Samnaun cheese fondue; or a smugglers’ Wurza (sausage, served with grated horseradish). Save room for dessert – apple strudel swimming in vanilla sauce. You’re sure to feel fortified for the second half of your circuit after a meal here. Each trail starts and ends at the lower terminus of the Fimbabahn in Ischgl or the Twinliner (lower terminus) in Samnaun. Be sure to pick up a special “Schmuggler Runde” (Smugglers’ Routes) pistemap in resort before you set off. You can track your progress around the circuits by downloading the free iSKiIschgl App (click HERE for more details) and also remember to register for the daily smugglers’ raffle (details below). The app tracks your progress around the trail off-line, so without any roaming charges. The smugglers’ route you choose will depend on your family group. But whichever one you do, one thing’s for sure – it’s a real adventure offering unforgettable family holiday memories and a great sense of achievement. You can find more information on Ischgl by clicking HERE, and on the Smuggler Circuits HERE. The resort App downloads for iOS and Android can be found HERE. Crystal Ski Holidays offers a week’s half board at the four-star Hotel Seiblishof in Ischgl from £1139 per person this January 2019 (based on two sharing, with flights from Gatwick to Innsbruck and transfers): £1225 per person for February half-term (based on two sharing, with flights from Newcastle to Innsbruck and transfers). Direct flights are available from all major UK airports. 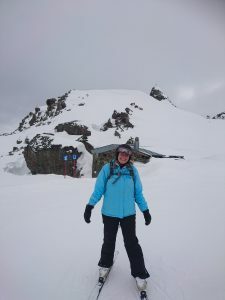 Teresa Fisher travelled courtesy of the Tourism Association Paznaun-Ischgl, Hotel Seiblishof and easyJet.